Prices for Intel’s upcoming Ivy Bridge-E HEDT processors have been unveiled by VR-Zone. Intel’s next HEDT platform “Ivy Bridge-E” launches on 11th September as revealed a few weeks ago bringing the latest 22nm architecture to high performance processors. As mentioned, Ivy Bridge-E comes with the 22nm architecture featuring high K+ metal gate core technology. Although its just a die shrink of the 32nm Sandy Bridge core, the Ivy Bridge-E CPUs would feature improved performance (around 10% increase as seen in the benchmarks leaked last week), 40 PCI-Express lanes (Generation 3.0), DDR3-1866 MHz memory support, Intel Hyper Threading, Intel Turbo Boost 2.0 and complete Unlocked CPU designs. The Ivy Bridge-E processors would be compatible with the current X79 chipset based LGA 2011 motherboards and would have 130 Watt TDP across the entire lineup. AMD is also preparing a new FX-9000 series lineup to compete against the $1000 chips from Intel which can be seen here. The flagship Intel Ivy Bridge-E CPU would be the Core i7-4960X packed with 6 cores and 12 threads and would feature a core clock of 3.6 GHz base and 4.0 GHz Turbo boost with 15 MB of L3 cache. The Extreme Edition CPU would cost $990 which is $60 less compared to Sandy Bridge-E based Core i7-3970X. The performance minded users would look forward to the Core i7-4930K with the same 6 core and 12 threads configuration however shipped with a lower core clock of 3.40 GHz base and 3.90 GHz with Turbo boost 2.0. The Core i7-4930K would feature 12 MB of L3 cache. The Core i7-4930K would cost $555 which is also cheaper than the $594 i7-3930K. Latest benchmarks of the Core i7-4960X processor can be found here. Last of all is the entry level Core i7-4820K which will retail at $310 which is $5 higher than its predecessor but should be noted that it comes with an Unlocked multiplier. As you may note, this time Intel thought it was better off to ship their entry level HEDT CPU with an unlocked multiplier while the Sandy Bridge-E based Core i7-3820 didn’t had an “K” unlocked design. Specifications wise, the Core i7-4820K ships with 4 Cores and 8 threads, 10 MB of L3 cache and 3.70 GHz base and 3.90 GHz Turbo frequency. 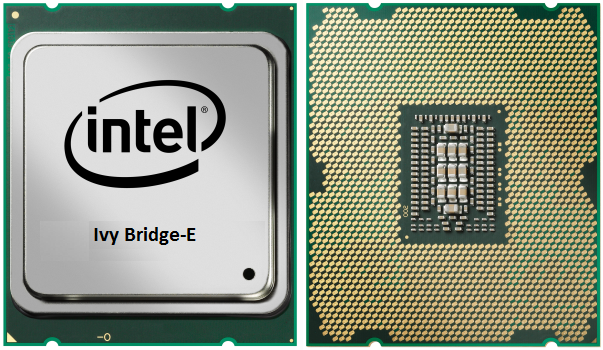 While Ivy Bridge-E is scheduled for early September as confirmed in today’s report, Intel’s next generation was also leaked as the Haswell-E HEDT platform codenamed “Lituya Bay” which would arrive in second half of 2014. Haswell-E chips would be based on the 22nm architecture and remain compatible with LGA 2011 socket however a new X99 “Wellsburg-X” chipset would be implemented on the next generation motherboards which would allow for native DDR4 memory support. You heard it right, Haswell-E would be the first HEDT platform by Intel to bring DDR4 memory support and feature upto 8 cores and 20 MB of L3 cache. More details can be found here.